Here’s what’s up in the world of TV for Sunday, March 31. All times are Eastern. Game Of Thrones (HBO, 9 p.m.): The TV adaptation of George R.R. Martin’s A Song Of Ice And Fire has been a Big Deal for two years, but the beginning of its third season seems like an Even Bigger Deal: After all, the leadup has produced more Emilia Clarke magazine covers and winning Peter Dinklage interviews than you can shake a scraggly Kit Harington whisker at. But none of that’ll matter if tonight’s première isn’t any good—and how could it not be good? It’s Game Of Thrones! 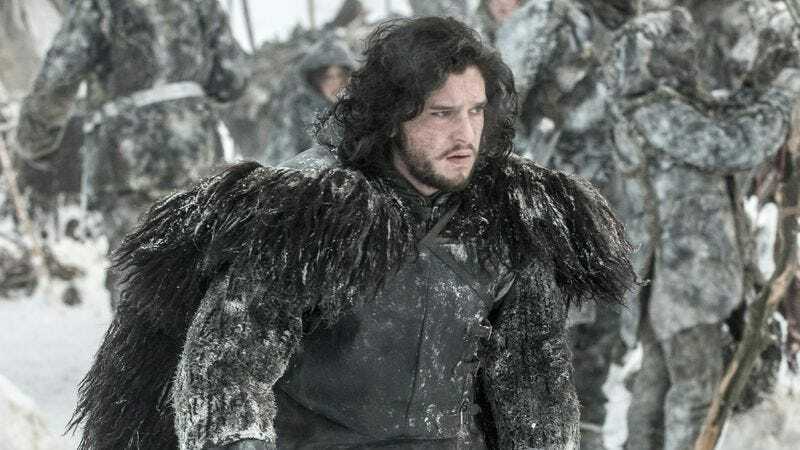 Jon Snow’s going to meet Mance Rayder! Todd VanDerWerff and David Sims are back on the beat! We’re in good hands here, people. Revenge (ABC, 9 p.m.): The Graysons throw a masquerade ball, which is perfect, because everyone on this show is already wearing a mask, because of secrets. Carrie Raisler’s mask is a lemur face! The Walking Dead (AMC, 9 p.m.): And just like that, The Walking Dead is no longer the only genre-TV phenomenon in town—so it’s getting out of here. Zack Handlen watches as White Walkers chase the Governor toward the prison. The Good Wife (CBS, 9 p.m.): A Supreme Court ruling could keep extra special guest Colin Sweeney from going to prison for life—because if The Good Wife is going to air for another decade and change, it should be able to call on Dylan Baker whenever it needs to. Hell, David Sims will even construct a Dylan Baker Signal from a police searchlight if it’ll help. Shameless (Showtime, 9 p.m.): Fiona and the kids go camping in an episode titled “Order Room Service.” Oh, Shameless—there’s no room service at a campground. That’s a lesson it took Joshua Alston half of a poison ivy salad to learn. Vikings (History, 10 p.m.): With this show being such an explicit attempt to ride Game Of Thrones’ coattails, it’ll be interesting to see how it fares now that its reason for existence is back. Dennis Perkins has a cool shield he’ll trade for a replica of The Lord of Bones’ armor. Farscape (11 a.m.): This week’s Sunday-morning wakeup image: Moya’s crew having needles poked into their eyes for DNA extraction. It’s kept Alasdair Wilkins up for three straight days. The Simpsons (Classic) (3 p.m.): Nathan Rabin says you just gotta try watching “Burns’ Heir”—it’s like kissing a peanut! The Talking Dead (AMC, 10 p.m.): Unpack one final Walking Dead episode with Chris Hardwick, before BBC America’s Nerdist show goes to his head and he thinks he’s too cool for talking about zombie shows. Snow White And The Huntsmen (HBO, 7 p.m): A nice thematic pairing with the Game Of Thrones première—though even a dwarf played by Ian McShane isn’t as badass as Tyrion. The Jerk (Encore, 11:15 p.m.): Funniest movie ever made about a man-child failing his way into the upper echelons of society, or funniest movie ever made period? MLB Baseball: Rangers at Astros (ESPN, 8 p.m.): And to top it all off, it’s Major League Baseball Opening Night! The excitement of this whole Sunday makes up for the fact that the Rangers are going to absolutely cream their new American League West rivals, who had the worst record in all of baseball last summer. Happy Endings (Friday): Remember, like ABC says: Only you can save Happy Endings. So hopefully you’ve already watched this week’s double header. At the very least, you could leave a nice comment on David Sims’ review.